The Mayor of London, Sadiq Khan has announced his ‘Building Council Homes for Londoners’ which is an initiative in which over £1billion is being given to local authorities across the capital to support the building of more homes that will be available at social rent levels. But local residents may question why Wandsworth,the largest are both geographically and by population in Inner London received such a small portion of the pie? 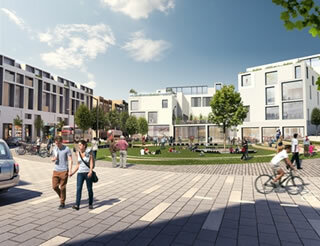 The grant will allow an extra 174 homes to be built, a drop in the ocean compared to Ealing Borough which is to receive £99,352,000 to provide an extra 1,138 homes. Sadiq Khan, said: “London’s housing crisis is hugely complex and has been decades in the making. There is no simple fix – but council housing is the most important part of the solution. Londoners need more council homes that they can genuinely afford, and local authorities have a fundamental role to play in getting London building the homes we need for the future". In response to the Mayor’s announcement that Wandsworth has been awarded £12,452,000 from his Building Council Homes for Londoners Programme, to deliver 174 council homes, local London Assembly Member, Leonie Cooper AM, said: “With too many local families priced out of the Wandsworth housing market and stuck in temporary accommodation, it has always been of the utmost priority that we get to grips with the housing crisis as a matter of urgency. The Government have sat on their hands when it comes to council homebuilding, which fell flat during the 1990s and Wandsworth Council has tended to prioritise Shared Ownership, so this money is especially welcome". Cllr Ravi Govindia, the Leader of Wandsworth Council appreciates the funding assistance however he is disappointed that it was only 62.3% of the funds requested,he told this website: “This money is part of a £4.8 billion Government grant to the Mayor to support new housing construction in London. We welcome this extra funding which will help us deliver our ambitious plans to kick start the regeneration of Roehampton’s Alton estate, but our total bid was for just under £20m so it is a little disappointing that we did not receive the full amount despite having a proven record of delivering affordable housing, which is better than most other London boroughs. We have already committed to build 1,000 homes on our own land of which 60 per cent will be for low cost rent and shared ownership and we are investing £80m from our own resources to fund these homes but we could have achieved much more if the Mayor had provided us with all the funds we’d asked for”. Ms Cooper called on the Government to provide additional funding: “However, we now have an opportunity with this funding to kickstart an ambitious new building programme and provide the next generation of homes for social rent that our community desperately needs. This could be boosted further if the Government provides the extra £2 billion of funding needed per year to cover the full-scale of the demand for all types of genuinely affordable housing in London”. Ms Cooper has been asked for her response to the relatively small size of the award.